On Sunday, Edie Littlefield Sundby, a stage-4 cancer patient, shared her heart-breaking story at the Wall Street Journal. Edie lost her health care plan and access to her cancer doctors thanks to Obamacare. 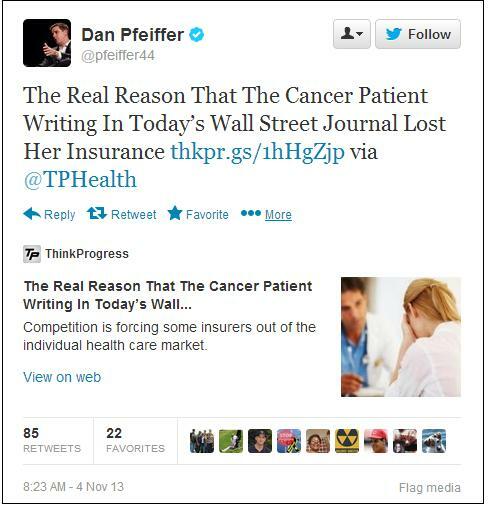 Today, in response to her article, Obama lackey Dan Pfeiffer tweeted out a posting at ThinkProgress.org smearing cancer victim Edie Sunby. This morning the White House went on the attack against a cancer patient who is also a victim of ObamaCare. Edie Littlefield Sundby of San Diego explains in today’s Wall Street Journal that she’s been managing a case of stage 4 gallbladder cancer, an affliction whose five-year survival rate is just 2% . Having survived the diagnosis by seven years so far, she beat very long odds–and she did so with the help of an excellent insurance plan that covered care at three hospitals, two in California and one in Texas. In touting ObamaCare, Obama asserted at least two dozen times (in slightly varying language) that if you like your health plan, you can keep it. As Sundby explains, she is a victim of Obama’s fraudulent sales pitch. . . . This morning Dan Pfeiffer the fast-talking flack tweeted out a piece from ThinkProgress.org, a leftist propaganda outfit. Titled “The Real Reason That the Cancer Patient Writing in Today’s Wall Street Journal Lost Her Insurance,” the piece, by one Igor Volsky, claims that “Sundby shouldn’t blame reform.” Volsky instead blames United Healthcare.